It is Wednesday afternoon and as I check the passenger totals for my stand-by flight on Thursday to Kansas City to attend the USA/Canada Lions Leadership Forum, I realize there is no way I can get there in time for the Thursday evening keynote speaker and dinner. I hurriedly throw clothes into my suitcase, pack up my 2 dogs to drop off at the kennel, and head to the airport. Not getting a seat on the 3:00 flight, I check my options. If I can get on the flight to San Francisco at 5:36, I will be able to make the red-eye to Houston, and make it to KC by 9:41 in plenty of time to make the opening events of the forum. As luck would have it (finally, some luck!) the 6:03 flight from San Francisco is delayed, and I make it to Kansas City at 1:30 am. Whew! What have I learned so far? Plan ahead! Now I've made it to the Overland Park Convention Center. The hallways are filled with Lions from all over the US and Canada. I take in the Exhibit Hall and the Lions Store. Luck continues as I find Twin Falls own PID Floyd Miller and we grab a bite to eat. Shortly thereafter, I find Lions Stevie Packard and Happy Olsen from the Boise Bench Club waiting to check in. Now things are starting to fall into place! Finally, the USA/Canada Forum 2013 has begun. Our next few posts will tell you more about the weekend that nine Lions from District 39W experienced in Overland Park. Stay tuned! 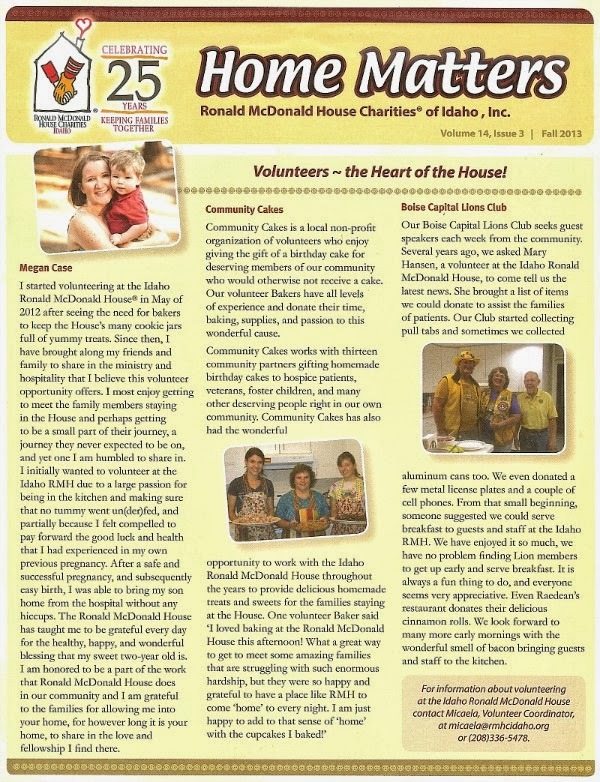 The Boise Capital Lions Club gives assistance to Ronald McDonald House Charities of Idaho as one of their ongoing projects. From collecting pull tabs from soda cans to cooking breakfast, the Lions give back to make things a little brighter for families when their children are undergoing hospital treatment. The recent edition of the Ronald McDonald House newsletter, "Home Matters", features the Lions on the cover page. Four times a year, the Lions cook breakfast for guests and staff, even bringing cinnamon rolls (yum!) donated by Radean's Restaurant. To volunteer with Ronald McDonald House, visit their website. To volunteer with the Boise Capital Lions, visit their website or facebook page. The Boise Vista Lions are partnering with St. Luke's Children's Hospital to provide a Halloween party for the children who are undergoing treatment at the hospital. 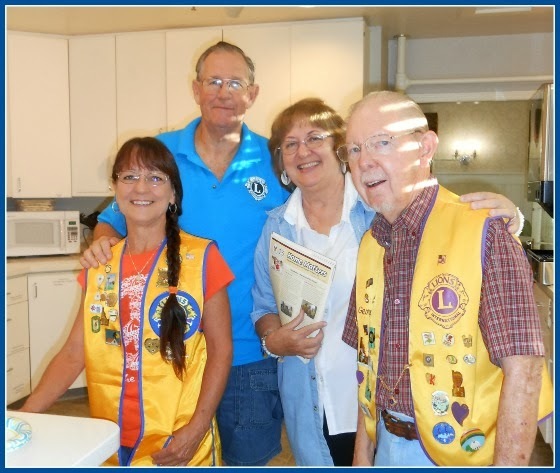 Over the next few weeks, PDG Ashley, Lion Paula Campbell, and other Boise Vista Lions will be visiting Lions clubs. They will be selling raffle tickets for a beautiful quilt with the proceeds going to St. Luke's Children's to purchase items to make the children's stays less stressful. Tickets will be $5.00 each or 3 for $10, so be prepared for the Vista Lions to visit your club. The hospital has also provided a list of toys and games they would like to have for the children. If you can donate any of these things, they would greatly appreciate it. For more information, or to purchase tickets, contact Ashley at 941-3238 or Paula at paulaj at cableone.net.